I never was able to find a good answer as to why cars of the period, from the 20s all the way to the early 50s, were set up with the top of the wheels pushing out, as if the inside wheel needs to pull out in turn rather than the outside, push in. The technical reason must have to do with the rigid front suspension but can anyone explain it in more technical terms? The Wikipedia article on camber angle says "Off-road vehicles such as agricultural tractors generally use positive camber. 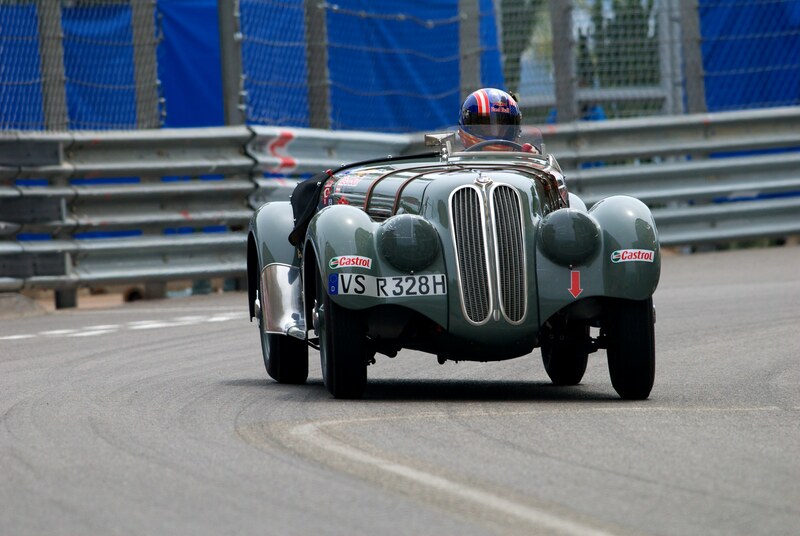 In such vehicles, the positive camber angle helps to achieve a lower steering effort." Now I don't know whether the steering on these old cars required a particularly big effort, but compared to current cars with wide tyres they probably didn't suffer that much through a reduction of the contact patch while going through a corner - because the contact patch was more like on today's bikes. Well, the steering effort explanation is also suffragated by the wide diameter of the steering wheel, that can be seen as a way to decrease steering effort by increasing the torque applied to the steering rod. Maybe because a higher steering ratio was not obtainable due to mechanical limitations. From what I have heard the cars of the time had terrible oversteer tendencies, so they put positive camber on the front tires in an attempt to balance the handling. 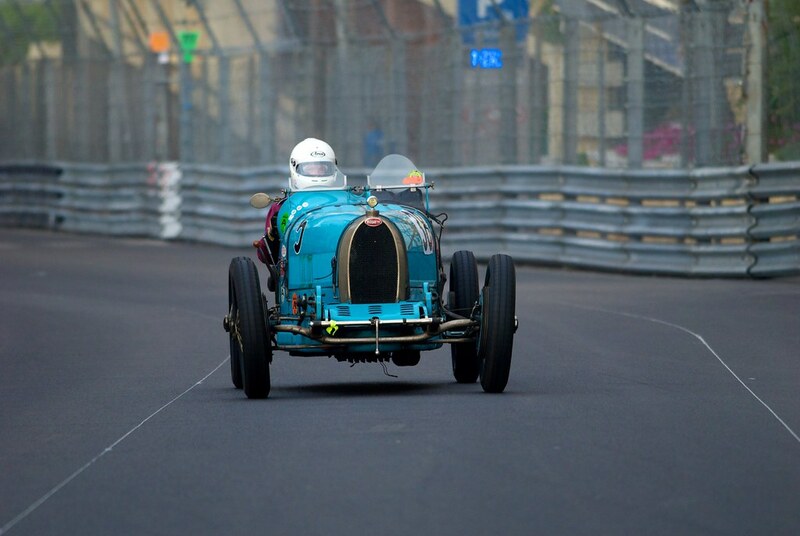 The geometry on that Bugatti would appear to have the steer axis intersecting the ground pretty near the contact patch. This might work to negate some of the effect of scrub radius and castor working together to lift the inside corner of the car when the steering wheel is turned, therefore leading to lower steering effort. Tire effects like camber thrust seem to have been poorly understood at the time, while geometry effects on steering probably were understood and designed in to decrease steering effort. A few months ago I spoke at length about this topic with the chief mechanic of an Alfa Romeo P3 (1935) vintage race team. Unfortunately while the mechanic knew intimately the gory details of nearly every aspect of the car, the only reason he knew why the car had positive camber was "because the factory made it that way". He did mention that camber is actually quite insignificant on the cars however, as the contact patch is so small, and the tires are so round (in cross section). If you look at the tires in person, they're almost shaped like a modern motorcycle tire. What was most interesting to me though was how "different, yet similar" everything the car was. For instance - the rear diff was not on the rear axle as we are accustomed. Instead, the rear diff is located approximately under the driver's seat, with then two drive shafts continuing to each rear wheel. Then at the rear wheel there is a final ring & pinion gear to drive the wheel. Because of this, changing gear ratios requires nearly a full tear-down of the car. So instead, they just change rear wheels to one of five different sizes. And how about those friction shocks? Could this have something to do with it? I don't know if camber causes a similar effect, but this would certainly make turning easier if it applied. If non-applicable, it's none the less interesting. Camber gain due to roll of a solid axle.